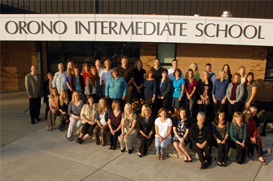 Orono Schools belong to Independent School District 278 and serves all or part of six western Minneapolis Suburbs: Independence, Long Lake, Maple Plain, Medina, Minnetonka Beach, and Orono. The district has been named as a National District of Character by the Character Education Partnership. Orono is one of only three districts nationwide to receive this esteemed award and the only district in the Midwest. The K-12 district belongs on a unique 120-acre central campus and is organized into four schools: Orono Schumann Elementary (K-2), Orono Intermediate School (3-5), Orono Middle School (6-8) and Orono High School (9-12). Approximately 2,210 students are enrolled each year. The central campus offers many amenities for students, staff, and families to enjoy including a first class childcare facility, swimming pool, Ice Arena, Nature study area, stadium, multiple tennis courts, four campus gymnasiums, two auditoriums, ample fields, and a community center. Orono Schumann Elementary School (SE) enrolls about 535 students each year and is located on the southern part of central campus. SE builds a curriculum around natural curiosity and creativity by using hands-on educational experiences both in and out of the classroom. SE offers small class sizes, field trips, self-contained or multi-age classrooms, gifted/talented education services, and much more. Orono Intermediate School (IS) has become a Reward School due to the outstanding student performance on the Minnesota Comprehensive Assessments in 2012. This indicates performance in the top 15% of title 1 schools in the state. IS enrolls about 600 students each year with an average class size of 25. Orono Middle School (OMS) enrolls about 710 students each year and is proud of their rigorous academics, qualified staff, and extra curricular activities. OMS offers many tools for families and students to enhance communication between school and home. OMS does a good job preparing each student for the future based on their unique passions, goals, and way of learning. Orono High School (OHS) is frequently distinguished for their excellence and performance. On average, 94% of OHS students continue their education at post- secondary schools after graduation. In addition to OHS’s core curriculum, electives and advance placement courses are available for students. More than 85% of OHS students participate in at least one extracurricular activity including: sports, drama, music programs, national honor society, student senate, student publications, and co-curricular competitions.